This environmental CSV is to address social issues through HCM’s businesses, products, and solutions. 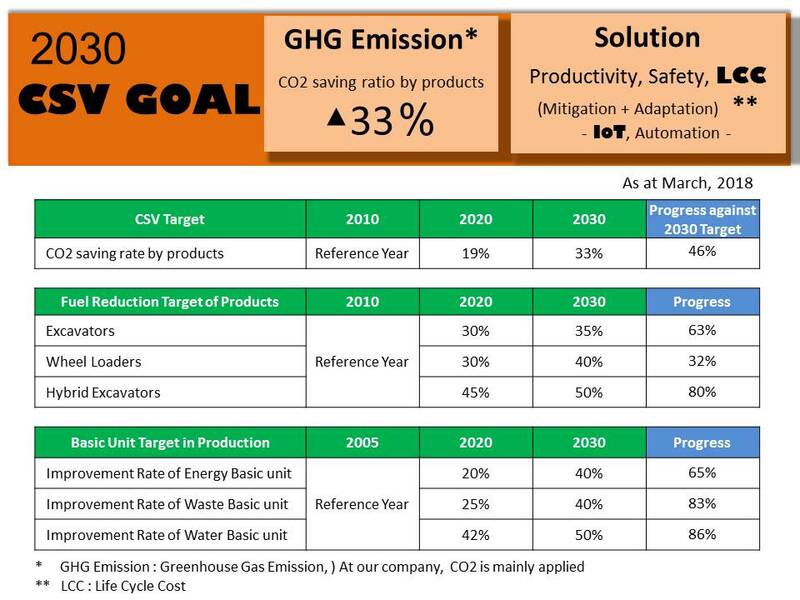 Our long-term goals up to 2030 are developed in line with “Hitachi Environment Innovation 2050.” HCM has concentrated these long-term targets into a medium-term plan and environmental action plan for individual fiscal years, while formulating eight categories and more than 30 KPIs to promote environmental conservation activities. Moving towards the realization of a low-carbon/recycling-oriented society which is strong on climate change, work on environmentally-friendly infrastructure is expanding globally. Together with our stakeholders, we intend to pursue low carbon/resource recycling in global infrastructure development through construction machinery and systems equipped with superior environmental technology and development with the vision to solve environmental issues, as well as contributing to infrastructure that can respond to disasters caused by climate change. – To work with our suppliers to realize a highly streamlined supply chain that lowers the environmental impact. – To collaborate with our customers to increase the efficiency of construction machinery and systems during use. – To improve infrastructure and business processes that positively contribute to the environment. – Together with people around the world, face the challenge of creating environmentally-friendly infrastructure in new fields and areas. These policies are directly connected to HCMs long-term corporate value creation aimed at “Abundant nature and vibrant cities – a bright future”. We “Kenkijin”, in the 3 fields of “Manufacturing” “Using” and “Challenge” are working with everyone involved in realizing our goal society to create value through maximizing business value and environmental value. Our efforts in expansion of business and environmental value is tied to securing of long term, stable profit for the group. We are managing and promoting some of our products and services related to environmental CSV in conjunction with the goals set within the mid-term management plan “CONNECT TOGETHER 2019”. Going forward, we will formulate even more systematic strategies for environmental CSV overall. HCM Group is working towards the realization of a low-carbon, recycling-oriented society, and coming from both product and solution angles in its 3 product themes, is tackling the task of creating environmental value via its business. HCM Group has positioned the uncertainty attributable to “climate change” and “water” as a serious management task in addition to the environmental risk analysis that we have conducted to date, and are formulating a CSV strategy aimed at minimizing the risks of “climate change” and “water”, while maximizing our business opportunities. As we examine risks and opportunities under the categories of “regulation”, “physical impact”, and “others”, we quantitatively analyze occurrence frequency, occurrence time as well as impact level, and determine materiality. Restrictions regarding air pollution and regulations such as carbon taxes are being introduced globally, and this is affecting business practices with respect to products and factories. However, we believe that promoting the energy-saving functions of products and cleaner emissions will lead to product competitiveness and further business opportunities. We believe that regulations and taxation systems that are beginning to be adopted around the world will bring risks and opportunities for business operations that encompass HCM’s products and production. Extreme weather that is a frequent occurrence in recent years is said to be one of the effects of global warming. Owing to large typhoons and the flooding of rivers, production activities at plants, and transportation of parts and products, etc. have been affected throughout the value chain. It is thought that the impact of such abnormal weather will become a risk for business continuity. Meanwhile, countries are beginning to promote adaptation. The disaster prevention and reduction technologies, products, and solutions that HCM have been working on can contribute to adaptation, and we believe this will be a new business opportunity for the HCM Group. A wide range of environmental activities such as social contribution activities as well as climate change measures for products and factories will be evaluated by stakeholders. For that reason, we are expected to disclose these activities appropriately on an ongoing basis. “Consite” conducted by the HCM Group is an IT solution which collects the operating status of products in real time and delivers reports containing environmental information to customers, and we believe that this type of customer service is a new business opportunity. HCM Group recognizes that the shortage of water resources is a serious environmental issue equivalent to climate change. The waste and contamination of water resources will present a serious crisis not only to our own production activities but also to local communities. The HCM Group has conducted activities analyzing water intake risks utilizing the WRI Aqueduct Water Risk Atlas Tool at individual production plants and has attained a thorough understanding of the importance of water in each area. We consider water risk as the water intake and drainage in a region with a production base. The amount of water intake is controlled on a per-unit basis, and for wastewater, a voluntary standard value is set, and measures have been taken to ensure thorough on-site treatment. However, infrastructure development for water shortages, floods, etc. is required throughout the world. HCM believes that contributing to infrastructure development including water access and forest conservation through products and solutions will lead to the expansion of business opportunities.